Place meat in a large stainless steel or glass container with a lid. Melt honey over low heat and add pepper and garlic powder. Mix well and pour over the meat. Marinate in fridge for 6-24 hours. 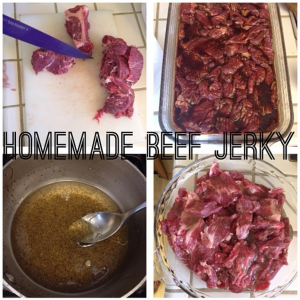 Place in dehydrator and follow the jerky specific instructions for time and temperature. If you do not have a dehydrator, use the oven on the lowest setting and check every 30 minutes to ensure it is not overcooked. If you don’t have a dehydrator, no problem. You can still cook this recipe in your oven. Another favorite recipe of ours is to make a batch using a Garlic Soy Marinade. It is a mixture of garlic and fermented soy sauce, Nama Shoyu.